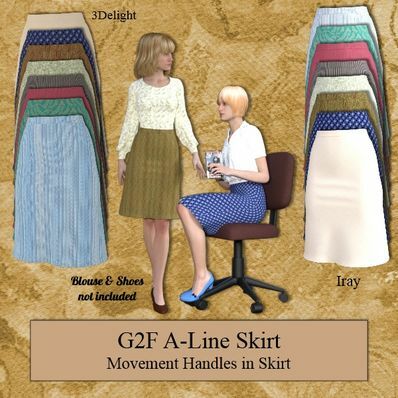 A Line Skirt for Genesis 2 Female for use in Daz Studio 4.8. Movement Handles included. I have also included several Textures for both 3Delight & Iray. I was wanted a decent clothing model to make a lovely OL (office lady) scene. Now you gave me something that will fit that bill perfectly! Thank you so much for all of these wonderful clothing items! Love it! Thank you, Wendy! Thanks for sharing these lovely skirts, Wendy. Very practical skirts. Thank you they look very smart. Thanks so much, these skirts look lovely! You're the BEST! That's a beautiful skirt. Nice to have some realistic every-day clothing! And thank you so much for continuing to support G2F!! !